My research interests are varied and include post-transplant anaemia and iron metabolism, and novel measures of iron status such as hepcidin; improving dialysis outcomes though the implementation of evidence-based guidelines; the investigation of a recently discovered sulfate transporter in patients with kidney stones; kidney disease due to thrombotic microangiopathy (particularly aHUS) and the use of honey to prevent infections in dialysis patients. I am committed to teaching medical students and young nephrologists, particularly in interventional nephrology and bedside ultrasonography. The impact of my research in peritoneal dialysis has been a significant improvement in PD-related infection rates in Australia, which until a few years ago were worse than many other countries in the world. 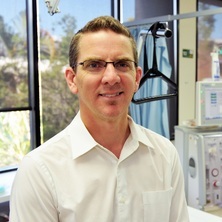 Through a variety of initiatives including a project aiming to improve the use of evidence-based guidelines in clinical practice, we have seen a significant improvement in PD-related infections (particularly peritonitis but also exit-site infections), one of the most significant contributors to peritoneal dialysis technique failure. In kidney transplantation my research has helped to clarify the role of immune suppressing medications on iron availability and anaemia and has looked at novel ways of measuring iron status in patients with kidney disease as well as better ways of enhancing iron stores in these patients. Abdul Razak, K., Mudge, D. W. and Johnson, D. W. (2014). Anaemia: prevalence, risk factors and management with a focus on chronic kidney disease. In Anemia: prevalence, risk factors and management strategies (pp. 123-146) Hauppauge, NY United States: Nova Science Publishers. Bose, Bhadran and Mudge, David (2011). Post-transplant anaemia. In Jorge Ortiz and Jason Andre (Ed. ), After the kidney transplant - The patients and their allograft (pp. 195-204) Croatia: Intech Open Access. Avoiding or stopping steroids in kidney transplant recipients: sounds good but does it work? Erythropoiesis-stimulating agents for anaemia in chronic kidney disease: are they all the same? Do aluminium-based phosphate binders continue to have a role in contemporary nephrology practice? Deceased donor renal transplantation - does side matter? Johnson, David W., Mudge, David W., Blizzard, Sophie, Arndt, Mary, O'Shea, Amanda, Watt, Rhonda, Hamilton, Jan, Cottingham, Sharon, Isbel, Nicole M. and Hawley, Carmel M. (2004) A comparison of peritoneal equilibration tests performed 1 and 4 weeks after PD commencement. Peritoneal Dialysis International, 24 5: 460-465. Johnson, David W., Mudge, David W., Sturtevant, Joanna M., Hawley, Carmel M., Campbell, Scott B., Isbel, Nicole M. and Hollett, Peter (2003) Predictors of decline of residual renal function in new peritoneal dialysis patients. Peritoneal Dialysis International, 23 3: 276-283. Mudge, D. (2000) Paracetamol and asthma. Thorax, 55 10: 882-882. Campbell, D., Craig, T., Mudge, D., Brown, F., Wong, G. and Tong, A. (2016). Patients' Perspectives On the Prevention and Treatment of Peritonitis in Peritoneal Dialysis: a Semi-Structured Interview Study. In: Nephrology. , , (164-164). .
Chan, S., Burke, M., Johnson, D., Francis, R. and Mudge, D. (2016). Tacrolimus toxicity due to biliary obstruction in a combined kidney and liver transplant recipient. In: 15th Asian Pacific Congress of Nephrology (APCN) and 52nd ANZSN ASM, Perth, Western Australia, (243-243). 17-21 September 2016. Holt, S. G., Gracey, D. M., Mudge, D. W., Irish, A. B., Sevastos, J., Walker, R. G., Baer, R. A., Levy, M. T. and Boyd, M. A. (2014). RENAL FUNCTION TESTING IN PATIENTS ON TENOFOVIR ANTIVIRAL THERAPY. In: , , (72-72). .
Rao, N., Borlace, M., Taylor, R., Matthew, Y., Jaffrey, L., Johnson, D., Mudge, D. and Bannister, K. (2013). Utility of "back up" arterio-venous fistulas in patients on peritoneal dialysis and use of central lines: A comparison between two Australian centres. In: 49th Annual Scientific Meeting of the Australian and New Zealand Society of Nephrology, Brisbane, Australia, (18-18). 9-11 September 2013. NXSTAGE Queensland health pilot program the early Australian NXSTAGE experience: is NXSTAGE really the next stage in home haemodialysis? Lee, A., Killen, J-P., Hawley, C., Jeffries, J., Equinox, K., Johnson, D., Campbell, S., Isbel, N., Mudge, D., Badve, S. and Van Eps, C. (2012). NXSTAGE Queensland health pilot program the early Australian NXSTAGE experience: is NXSTAGE really the next stage in home haemodialysis?. In: Abstracts of the 48th Annual Scientific Meeting of the Australian and New Zealand Society of Nephrology. 48th Annual Scientific Meeting of the Australian and New Zealand Society of Nephrology, Auckland, New Zealand, (50-50). 27‐29 August 2012. Bose, B., Mallett, A., Badve, S. V., Johnson, D. W., Hawley, C., Mudge, D., Van Eps, C., Campbell, S. and Isbel, N. (2012). Two cases of atypical haemolytic uremic syndrome treated with Eculizumab. In: Abstracts of the 48th Annual Scientific Meeting of the Australian and New Zealand Society of Nephrology. 48th Annual Scientific Meeting of the Australian and New Zealand Society of Nephrology, Auckland, New Zealand, (91-92). 27‐29 August 2012. Mills, K. A. and Mudge, D. W. (2011). NURSE PRACTITIONER EXPANDED PRACTICE AND PATIENT SAFETY WITH REMOVAL OF CENTRAL VENOUS DIALYSIS CATHETERS. In: , , (30-30). .
Cho, Y., Mills, K., Sturtevant, J., Pillans, P. and Mudge, D. (2010). DABIGATRAN MAY NOT BE AN ADEQUATE ANTICOAGULANT FOR HAEMODIALYSIS. In: , , (37-38). .
Thirugnanasambanthan, T., Mills, K. and Mudge, D. (2010). IMPROVED SEROCONVERSION WITH INTRADERMAL HEPATITIS B VACCINATION IN HAEMODIALYSIS PATIENTS NONRESPONSIVE TO INTRAMUSCULAR VACCINATION. In: , , (83-83). .
Mudge, D., Jose, M., Johnson, D., Tranaeus, A., Voss, D., Walker, R. and Bannister, K. (2010). Peritoneal dialysis practice in Australia and New Zealand: a call to action. In: 46th Annual Scientific Meeting of the Australian and New Zealand Society of Nephrology, Perth, Western Australia, (56-56). 12-15 September 2010. Aminoglycosides in haemodialysis patients: Should we be dosing pre-dialysis rather then post-dialysis? Van Eps, CL, Jeffries, L, Haluska, B, Hawley, CM, Jeffries, J, Johnson, DW, Campbell, SB, Isbel, NM, Mudge, DW and Marwick, TH (2009). NO IMPROVEMENT IN CARDIAC STRUCTURE AND FUNCTION IN ALTERNATE NIGHTLY HAEMODIALYSIS. In: NEPHROLOGY. 45th Annual Scientific Meeting of the Australian and New Zealand Society of Nephrology, Hobart, Australia, (A44-A44). 7–9 September 2009. Van Eps, C. L., Jeffries, L., Haluska, B., Hawley, C. M., Jeffries, J., Johnson, D. W., Campbell, S. B., Isbel, N. M., Mudge, D. W. and Marwick, T. H. (2009). Vascular structure and function in alternate nightly nocturnal haemodialysis. In: 45th Annual Scientific Meeting of the Australian and New Zealand Society of Nephrology Conference Abstracts. 45th Annual Scientific Meeting of the Australian and New Zealand Society of Nephrology , Hobart, Tasmania, Australia, (A43-A44). 7–9 September 2009. Frazier, J., Lipka, G., Johnson, D., Hawley, C., Campbell, S., Mudge, D., Van Eps, C., Isbel, N. and Macdonald, G. (2008). CHRONIC KIDNEY DISEASE FOLLOWING ORTHOTOPIC LIVER TRANSPLANTION. In: , , (A115-A115). .
Govindarajulu, S., Frazier, J., Van Eps, C., Isbel, N., Campbell, S., Johnson, D., Mudge, D. and Hawley, C. (2008). PAINFUL LEFT BREAST IN A PATIENT WITH ESKD: A DIAGNOSTIC PROBLEM. In: , , (A111-A111). . Miles, R., Van Eps, C., Jeffries, J., Johnson, D., Campbell, S., Isbel, N., Mudge, D., Burke, J. and Hawley, C. (2008). PREVIOUS TREATMENT MODALITY OF PATIENTS ENTERING A CONTEMPORARY HOME HAEMODIALYSIS PROGRAM: A MINORITY TRANSFER FROM PERITONEAL DIALYSIS. In: , , (A150-A150). .
Kaisar, Mohd, Armstrong, Kirsten, Hawley, Carmel, Campbell, Scott, Mudge, David, Johnson, David, Prins, John and Isbel, Nicole (2008). Adiponectin is associated with cardiovascular disease in renal transplant recipients: Baseline results from the LANDMARK 2 study. In: 8th American Transplant Congress, Toronto, Canada, (594-594). 31 May - 4 June 2008 . Frazier, J., Blizzard, S., Douglas, B., Oliver, V., Johnson, D., Hawley, C., Campbell, S., Mudge, D. and Isbel, N. (2008). Chronic kidney disease management: a multidisciplinary clinic model. In: 44th Annual Scientific Meeting of the Australian and New Zealand Society of Nephrology, Newcastle, Australia, (A141-A142). 6-10 September 2008. Miles, R., Butterly, S., Pillans, P., Sturtevant, J., Johnson, D., Campbell, S., Hawley, C., Mudge, D. and Van Eps, C. (2008). Off-label use of rituximab in a tertiary referral renal unit. In: 44th Annual Scientific Meeting of the Australian and New Zealand Society of Nephrology, Newcastle, Australia, (A106-A106). 6-10 September. Mudge, D. W., Morton, A. and Campbell, S. B. (2007). SUCCESSFUL TWIN PREGNANCY IN A LIVER TRANSPLANT RECIPIENT REQUIRING HAEMODIALYSIS. In: , , (A4-A4). .
Clark, C. J., Johnson, D., Hawley, C., May, K., Campbell, S., Isbel, N., Mudge, D. and Burke, J. (2007). Access infection in dialysis patients: A comparison of peritoneal vs haemodialysis in a large dialysis population. In: 43rd Australian and New Zealand Society of Nephrology Annual Scientific Meeting, Gold Coast, Australia, (A37-A37). 8–12 September 2007.
van Eps, Carolyn, Jeffries, Janine, Isbel, Nicole, Johnson, David, Campbell, Scott, Mudge, David and Hawley, Carmel (2007). Adverse outcomes in alternate nightly home nocturnal haemodialysis. In: 44th ERA-EDTA Congress, Barcelona, Spain, (161-162). 22-24 June 2007 . Kaisar, M. O., Hawley, C. M., Mudge, D. W., Campbell, S. B., Johnson, D. W. and Isbel, N. M. (2007). Collapsing glomerulopathy secondary to human parvovirus b19 in a kidney-pancreas transplant recipient. In: 43rd Australian and New Zealand Society of Nephrology Annual Scientific Meeting, Gold Coast, Australia, (A30-A30). 8–12 September 2007. Kaisar, M. O., Isbel, N., Hawley, C., Johnson, D., Mudge, D., Griffin, A., Wall, D., Preston, J., Nicol, D. and Campbell, S. (2007). Follow-up of 15 years of live donors in a large Australian renal transplant unit. In: 43rd Australian and New Zealand Society of Nephrology Annual Scientific Meeting, Gold Coast, Australia, (A25-A25). 8–12 September 2007. Van Eps, C. L., Jeffries, J. K., Ng, T. G., Isbel, N. M., Johnson, D. W., Campbell, S. B., Mudge, D. W. and Hawley, C. M. (2007). Hospital admission rates in alternate nightly nocturnal home haemodialysis. In: 43rd Australian and New Zealand Society of Nephrology Annual Scientific Meeting Programme and Abstracts. 43rd Australian and New Zealand Society of Nephrology Annual Scientific Meeting, Gold Coast, Australia, (A22-A22). 8–12 September 2007. Kaisar, M. O., Campbell, S., Hawley, C., Johnson, D., Mudge, D., Griffin, A., Wall, D., Preston, J., Nicol, D. and Isbel, N. (2007). Live donor characteristics over the last 15 years. In: 43rd Australian and New Zealand Society of Nephrology Annual Scientific Meeting Programme and Abstracts . 43rd Australian and New Zealand Society of Nephrology Annual Scientific Meeting, Gold Coast, Australia, (A25-A25). 8–12 September 2007. Clark, C. J., Johnson, D., Hawley, C., May, K., Campbell, S., Isbel, N., Mudge, D. and Burke, J. (2007). The effect of diabetes mellitus on access related infection in both peritoneal dialysis and haemodialysis patients. In: 43rd Australian and New Zealand Society of Nephrology Annual Scientific Meeting Programme and Abstracts. 43rd Australian and New Zealand Society of Nephrology Annual Scientific Meeting, Gold Coast, Australia, (A37-A37). 8–12 September 2007. Clark, C. J., Johnson, D., Hawley, C., May, K., Campbell, S., Isbel, N., Mudge, D. and Burke, J. (2007). The impact of late referral to a nephrologist on access infections in peritoneal dialysis (PD) and haemodialysis (HD). In: 43rd Australian and New Zealand Society of Nephrology Annual Scientific Meeting Programme and Abstracts. 43rd Australian and New Zealand Society of Nephrology Annual Scientific Meeting, Gold Coast, Australia, (A37-A37). 8–12 September 2007. Frazier, J., Johnson, D., Hawley, C., Campbell, S., Mudge, D., Van Eps, C., Isbel, N. and Leslie, J. (2007). The prevalence of obesity in CKD. In: 43rd Australian and New Zealand Society of Nephrology Annual Scientific Meeting, Gold Coast, Australia, (A44-A44). 8–12 September 2007. Van Eps, C. L., Jeffries, J., Anderson, J., Johnsonj, D. W., Campbell, S. B., Isbel, N. M., Mudge, D. W. and Hawley, C. M. (2006). BONE MINERAL METABOLISM AND HISTOLOGY IN ALTERNATE NIGHTLY NOCTURNAL HAEMODIALYSIS. In: , , (A34-A34). .
Wong, J. S., Wiggins, K. J., Campbell, S. B., Isbel, N. M., Mudge, D. W., Hawley, C. M. and Johnson, D. W. (2006). A randomized, controlled trial of coiled versus straight swan neck tenckhoff catheters in peritoneal dialysis patients. In: 42nd Annual Scientific Meeting of the Australian and New Zealand Society of Nephrology, Melbourne, Australia, (A16-A16). 14–18 August 2006.
van Eps, Carolyn, Jeffries, Janine, Diamond, Terrence, Anderson, John, Johnson, David, Campbell, Scott, Isbel, Nicole, Mudge, David and Hawley, Carmel (2006). Bone histology in alternate nightly home haemodialysis. In: 43rd ERA-EDTA Congress, Glasgow, Scotland, (140-141). 15-18 July 2006 . Armstrong, K., Johnson, D., De Silva, N., Pidcock, R., Orazio, L., Prins, J., Campbell, S., Hawley, C., Mudge, D., Marwick, T. and Isbel, N. (2006). Effectiveness of a cardiovascular risk factor modification program in insulin-resistant renal transplant recipients. In: Abstracts from the 24th Annual Scientific Meeting. 24th Annual Scientific Meeting of the Transplantation Society of Australia and New Zealand, Canberra, Australia, (A20-A20). 29–31 March 2006. Mudge, D. W., Hawley, C. M., Johnson, D., Isbel, N. M., Campbell, S. B., Griffin, A., Preston, J. and Nicol, D. (2006). Estimated donor GFR is the most important donor characteristic predicting graft function in recipients of live donor kidneys. In: Program and Abstracts from the 42nd Annual Scientific Meeting of the Australian and New Zealand Society of Nephrology. 42nd Annual Scientific Meeting of the Australian and New Zealand Society of Nephrology, Melbourne, Australia, (A37-A37). 14–18 August 2006. Wong, J. S., Campbell, S. B., Hawley, C. M., Johnson, D. W., Mudge, D. W. and Isbel, N. M. (2006). Outcomes of kidney transplant recipients on Warfarin at time of transplant. In: 42nd Annual Scientific Meeting of the Australian and New Zealand Society of Nephrology, Melbourne, Australia, (A25-A25). 14–18 August 2006.